Place eggs, in a single layer, in a medium pot and cover with cool water (1 inch of water over the eggs). Bring to a boil over high heat. As soon as the water reaches a rapid boil, remove pot from heat and cover tightly with a lid. After 17 to 20 minutes, remove lid and drain water from the eggs. Transfer the eggs to a bowl of ice cubes and/or cold water; let eggs cool at least 10 minutes in cold water, then drain. Peel eggs to remove the shell. Mash, grate, or chop the eggs and transfer them to a medium mixing bowl. Add mayonnaise, cucumber, green onion, dill, salt and pepper and mix well. Cover and chill egg salad in the refrigerator for at least 1 hour. 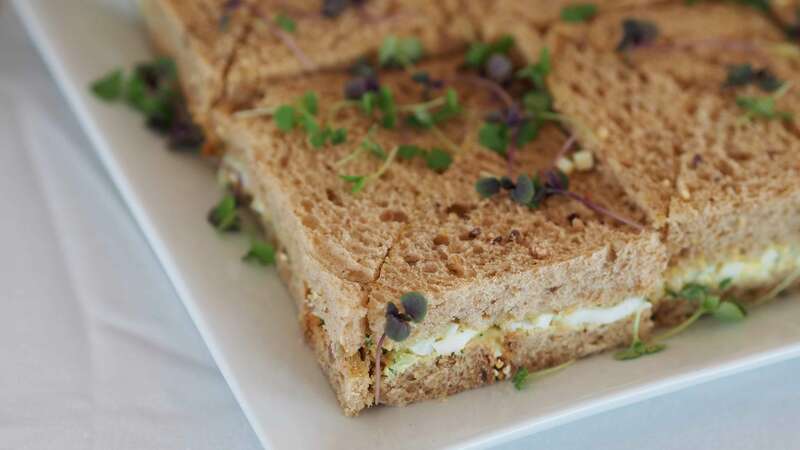 Divide egg salad between 6 slices of bread and spread evenly over the surface of the bread. Top with remaining slices of bread and using a serrated knife, trim crusts from sandwiches. Cut each sandwich into 4 triangles and transfer to a platter. Garnish sandwiches with microgreens; optional. May be served immediately or covered and refrigerated.